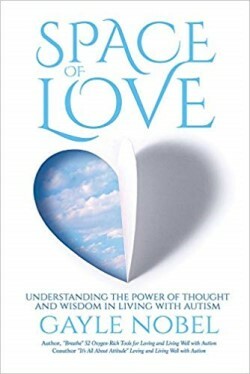 Summary: For people living with a child or adult with autism, special needs, or any life situation that is emotionally difficult: If you feel like you have reached the end of your rope and have run out of solutions, Space of Love offers an energizing lifeline and a brand new perspective on how to approach many personal concerns. This book centers the reader. It offers hope and inspiration. Anytime a person needs an emotional pick-me-up, it provides a soothing surge of self empowerment. Like healing meditation, you’ll find yourself wanting to read this book again and again. The author posits: What if the stress and strain you feel is not coming from the challenges or the obstacles in your life, condition of autism, or your child’s or another loved one’s behavior? The answer to that question–a profound understanding of the human experience–is the gift of Space of Love. This is the author’s third book on Autism and is not the usual book of information on Autism as she has covered that in previous books. This book is a mixture of poems and motivational thoughts about living with Wisdom with a few stories of her son mixed in. Gayle’s autistic son is an adult which means she knows how to deal with Autism and also she can give some advice on caring for an adult with Autism. The poems were really nice and I don’t usually care for poems so that’s saying a lot I think. It was definitely a quick read and I think it would be more beneficial to someone caring for an older kid or adult with Autism so already knows the basics of the condition and it’s possible treatments. It will not be helpful for someone new to Autism I don’t think. Not that the information isn’t helpful, but just that I think someone who just received the diagnosis won’t quite be at the right point to appreciate this book. Buy Space of Love from Amazon.com and help support the blog.